John McCain’s surprise, middle-of-the-night thumb down that sunk his party’s Obamacare repeal bill last week made for perfect political showbiz. But signals the Arizona Republican would be the final GOP defector were there all along. After all, McCain’s a mostly free spirit from a state that deeply benefited from the Affordable Care Act. And he likes some drama now and again. McCain’s never really belonged to the brand of tea party-style Republicans who loved to rail against Obamacare. He criticized the ACA when he needed to, like when he was running for reelection in 2010 and again last year. But McCain didn’t share many of his colleagues’ perspective that virtually anything would be better than President Obama’s health-care law. Besides, McCain is used to ducking the party line on other issues, too, like campaign finance reform and climate change. “There’s a certain impulsiveness about McCain, and every once in a while he tends to stray from orthodoxy,” David Berman, a political science professor at Arizona State University, told me. If there were ever a time for McCain to stray from orthodoxy and do whatever he wants, it’s now. Just a few days before the Senate vote on its "skinny repeal" bill, the 80-year-old announced he has glioblastoma, a common but aggressive form of brain cancer. So while McCain sees the same realities back home as Arizona’s other senator, Republican Jeff Flake, the two parted ways on Obamacare partly because they are facing far different political situations. McCain, in all likelihood, never has to worry about another election, while Flake is facing a potentially tough reelection race next year. Speaking of those realities back home, they’re harsh. Arizona is among the handful of Republican-led states that expanded Medicaid to cover low-income, childless adults. That program, along with new opportunities for coverage through federally subsidized marketplace plans, has provided coverage to half a million Arizonans over the past few years. Arizona’s uninsured rate fell from 17.3 percent in 2009 to 10.8 in 2015 – the 13th-largest drop in the nation during that time. “Arizona was about to get screwed, if I may, under this plan," McCain told Phoenix-based radio host Mike Broomhead yesterday. McCain’s “no” vote has won him praise among health-care advocates in Arizona. “I think people are pretty pleased with him in the world I work in,” Greg Vigdor, president of the Arizona Hospital and Healthcare Association, told The Health 202. But McCain wasn’t just frustrated by the GOP legislation itself – he’d also expressed annoyance all along at the Senate GOP leadership’s secretive process in writing it, at times even mocking the lack of transparency. “Damned if I know,” McCain responded in May when I asked whether he expects a health-care vote this summer. McCain displayed that love for Senate procedure and regular order in a floor speech he gave on July 25, his first time in the chamber since announcing his cancer diagnosis. In that speech, which Democrats being cut out of the health-care process especially hailed, McCain in strong terms blasted GOP leadership for trying to cram through an unpopular Obamacare repeal measure and called in his party to start reaching across the aisle. “We’ve tried to do this by coming up with a proposal behind closed doors in consultation with the administration, then springing it on skeptical members, trying to convince them it’s better than nothing, asking us to swallow our doubts and force it past a unified opposition," McCain said. "I don’t think that is going to work in the end." Chuck Schumer chokes up when he starts talking about John McCain, and his speech the other day. Of course McCain, who lost to President Obama in 2008, doesn’t eschew the limelight, either. Reporters hounded him last week after he emerged as one of the chief GOP skeptics of the repeal effort. As he walked into the Senate chamber around 1 a.m. on July 28 for the “skinny repeal” vote, he played coy amid the flood of questions about which way he leaned. “Watch the show,” McCain told reporters. That John McCain speech is actually aging pretty well right about now. And in the end McCain lived up to his speech and cast the most important vote of his career. Programming note: The Health 202 will not publish on Monday, Aug. 7 and on Friday, Aug. 11 next week. We’ll be back in your inbox on Tuesday. In the meantime, be sure to read our colleague Tory Newmyer’s The Finance 202 every day next week. AHH: What better way to mend fences than over a couple of beers? Interior Secretary Ryan Zinke says he's patched things up with Alaska Sen. Lisa Murkowski (R) after a widely reported dispute over her vote last week against starting the health-care debate, according to the AP. Murkowski, who leads the Senate Energy and Natural Resources Committee, was one of two Republicans to vote against starting health-care debate (along with Sen. Susan Collins of Maine) and joined both Colins and McCain to ultimately vote against the "skinny repeal" bill. OOF: Maybe the Senate's embarrassing failure to pass Obamacare repeal was a blessing in disguise for Republicans. A new poll taken in the days just after the Senate failed to pass a series of different options finds staggering opposition toward the GOP effort. Eighty percent of registered voters in a Quinnipiac University poll -- including 60 percent of self-identified Republicans -- said they disapproved of the way Republicans were handling health care. Just one-fourth of respondents said they were in favor of alternative health-care legislation presented by the Senate. OUCH: Wait for it, wait for it. Here it is: The House GOP health-care defense is "maybe the Senate didn't manage to pass Obamacare repeal but thank goodness we did." That's essentially how Speaker Paul D. Ryan (R-Wis.P) responded to constituents yesterday, when they blasted congressional Republicans for getting little done this year even though they control both houses of Congress and the White House. Ryan said he's worried too -- and noted that the House did pass a health-care bill in May. --New Hampshire is notorious for its drug-abuse problems. But Trump didn't do himself any political favors by depicting the entire state as one big "drug den" in s phone call with Mexican President Enrique Peña Nieto six days after his inauguration. “I won New Hampshire because New Hampshire is a drug-infested den,” Trump told Nieto in a phone call on Jan. 27. The call was private, but The Post's Greg Miller obtained the transcript — plus an equally eyebrow-raising one of a call with Australian Prime Minister Malcolm Turnbull. "Soon after Memorial Day, McConnell drew up a game plan around approving a rewrite of the Affordable Care Act by the end of June. The benefits were twofold, providing House Republicans a few weeks to approve the Senate version and send it to President Trump," Paul writes. "Also, McConnell wanted to create separation between the conclusion of the health-care debate and the start of the annual August recess, providing the month of July to rack up victories on other legislative matters. Such wins would give some Senate Republicans, wary of tackling the health-care issue back home, something else to tout with their voters." Instead, everything got consumed by the health-care storm, which culminated in the bill failing by a single vote last week. Then yesterday, the Senate left town for a five-week break with no major legislative accomplishments to show for the first seven months of unified Republican control of Congress and the White House. "When they return after Labor Day, Republicans have to tackle several must-pass bills to fund federal agencies and to increase the Treasury’s borrowing authority. Those are perfunctory tasks, but without the proper tending, failure would result in government shutdowns or worse. That leaves October, maybe, for the point to legislative offense, particularly on the bid to overhaul the tax code....This is the scenario McConnell was trying to avoid back in early June." Without fanfare or controversy, the Senate approved legislation that will keep many FDAoperations running and deliver a win to the pharmaceutical industry. 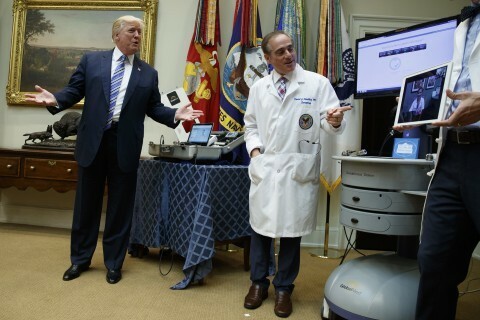 President Donald Trump announced new efforts Thursday to use technology to improve veterans’ health care, saying the programs will greatly expand access, especially for mental health care and suicide prevention. Veterans living in rural areas will also benefit, he said. Dr. Jerome Adams, Trump’s nominee for surgeon general, tried to make a distinction between guns and gun violence during his confirmation hearing. 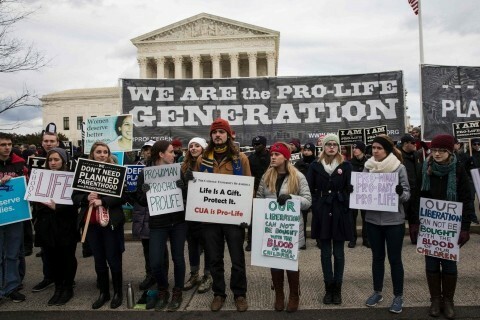 We're not the same as antiabortion Republicans. Really. Congress is officially on recess and will return to Washington on September 5.